Gain Insight into Brain Response with BIS Technology. BIS technology offers clinicians added security for providing specialized care and comfort for their patients, including those who may be more sensitive to the hemodynamic effects of anesthesia. BIS monitoring provides valuable information about the patient status to help clinicians address each patients unique anesthetic requirements. Patients with complex conditions whose status may suddenly or frequently change. Trauma patients or others requiring reduced levels of anesthesia. BIS sensors collect electroencephalograph (EEG) data. BIS technology enables simple EEG data collection via a noninvasive sensor applied to the patients forehead. Connector provides secure click-in connection with push button release. Self-prepping Zipprep technology ensures good skin contact and optimal signal quality. Longer tab, combined with rubberized PIC connector, provides increased comfort, especially in prone patients. Fourth sensor element helps capture, recognize and discard artifact. Flexible design adjusts to different head sizes. Raw EEG data are obtained through a sensor placed on the patients forehead. The BIS monitoring system processes the EEG information and calculates a number between 0 and 100 that provides a direct measure of the patients level of consciousness. A BIS value of 100 indicates the patient is fully awake. A BIS value of 0 indicates the absence of brain activity. Sensor dimensions 11 in. x 1.1 in. (approx.). Weight (packaged) 16.8 g (approx.). Packaging 25 individually packaged sensors per box. Shelf life One and a half years from date of manufacture. Connector (paddle) Polycarbonate plastic (incidental patient contact). Tab stiffener Polycarbonate sheet (no patient contact). One side coated with adhesive. Module Copper/brass/Kapton* (no patient contact). Flexible circuit Polyester screen-printed with cured Ag/AgCl and dielectric inks (incidental patient contact). Electrode gel Potassium chloride (KCl) aqueous gel. 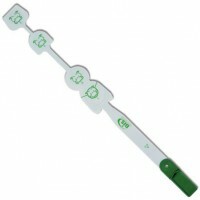 Electrode tines disk Green nylon plastic. Electrode sponge disk Polyurethane/polyester foam. Electrode tines retaining disk 1/32 in. white polyethylene foam (no patient contact). Both sides coated with medical-grade adhesive. Basepad 1/16 in. white polyethylene foam. Liner card Silicone-coated high-impact polystyrene (no patient contact). Packaging Paper/aluminum foil/polyethylene (no patient contact).